Remember that when you place your order - you will probably have to wait up to 1 year to receive the plants as the cuttings are made specifically for the buyer. 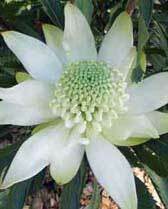 Waratahs are grown in 75mm. tubes, propagated to order. Standard price is $4.50 per tube. A deposit of 10% is required when placing the order. Clones with PBR (Plant Breeders rights) will require a royalty of 50c/tube. West Australian orders require a "Health Certificate" adding $80/0rder. Plants will not be released until full payment is received The buyer is to arrange Transport Orders will be available within 12 months, cuttings will have well developed roots and generaly have the leaf axil bud developed. Helpful information may be found in the publication "The Waratah" by Paul Nixon Kangaroo Press, 1997, pages 44 to 65. This book is available for $20 including P&H.